I saw these spots as we arrived to the retreat center in the woods. At the same time, I remembered what used to be there. Camp days were long ago, but from what I could see not much had changed. I was actually glad for the chance to explore the area as an adult. My mom continued to drive and I took in all the sights, waiting for the chance to get out of the van and wander. I almost headed for a path when we first arrived. Almost. I quickly turned around because the retreat would begin soon and it was dinnertime. Walking into the main building, I remembered the space and even the air had a familiar scent. The building seemed bigger when I was a child. I immediately realized the décor was exactly the same. The walls held deer heads and other treasures from someone’s hunting days. I would see the giant bear in the corner the next day and the polar bear and other animals surrounding the conference room. I posed for a picture with the polar bear to replicate one I’m sure I took back in the day. I smiled because I felt at home in this room. Yes, in the room with the animals. I had spent hours there. It’s where I ate every meal during camp. I would catch up with other friends and the same room was transformed for a talent show and dance party later in the week. My memories are a bit scattered, but that weekend away in February reminded me of several favorite camp moments. I took a walk and wandered through the area before I went back home, driving my wheelchair over the bumps and in the dirt. There was also the spot where I cried to the camp doctor who thought I had the pink eye. I’m pretty sure I was glad to go home at the end of that week. 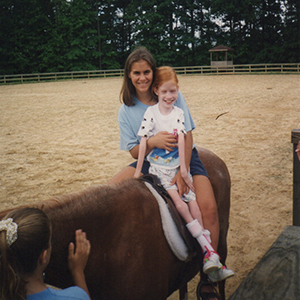 Every year at camp was not a blast, but many of these memories make me smile. And the fun activities I did when I was little stirred up an adventurous spirit. Now I love to find adventures, small ones or big ones, and the kind you can create any ordinary day.